Photograph of the accident, courtesy of @culvercityfirefighters. In July of 2017, a driver blamed his Tesla’s autopilot system for causing the car to flip and injure five passengers. The driver, David Clark, claimed that he had his Tesla’s autopilot system engaged when the car suddenly accelerated, causing his vehicle to flip. A subsequent investigation of the accident revealed that Mr. Clark was at fault for the accident because he had “disengaged” autopilot by stepping on the accelerator prior to entering a sharp curve in the road. Tesla’s autopilot system works by using the vehicle’s eight cameras to bounce a signal around the car. According to Tesla, the cameras provide 360 degrees of visibility, at up to 250 meters of range. Ultrasonic sensors, coupled with the cameras, allow the car to detect both hard and soft objects. This allows the system to “see” ahead of the car in front of the driver and analyze the position of other vehicles on the road and apply braking if necessary. Tesla’s autopilot system will also match the vehicle’s speed to traffic conditions, automatically changes lanes without the driver’s input, exit the highway, and self-park. Tesla maintains that a driver using its autopilot driving system is ultimately responsible for causing a car accident. Prior to activating Tesla’s autopilot system, an acknowledgment box pops up that explains that autopilot is an assist feature that requires the driver to keep his or her hands on the steering wheel at all times and be prepared to take over at any time. As a safety precaution, Tesla’s autopilot system automatically turns off if the driver removes his or her hands from the steering wheel. Tesla maintains that its autopilot system is not perfect and requires the driver to remain alert. Ultimately, a driver using Tesla’s autopilot driving system should not rely on autopilot and should remain actively engaged in driving the vehicle. 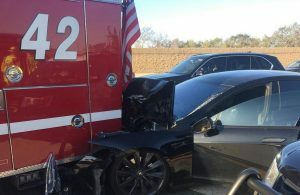 As injuries from using Tesla’s autopilot system increase, it is clear that the accidents could easily have been prevented by the driver staying engaged and by applying the vehicle’s brakes. For more information about product liability, visit our page HERE. If you or a loved one has been injured by driver who was using Tesla’s autopilot driving system, contact car accident attorney John Malm at John J. Malm & Associates to learn more about how you may be entitled to receive compensation for your injuries.